Look! Up in the sky! It's a bird; it's a plane; no it's Superman! 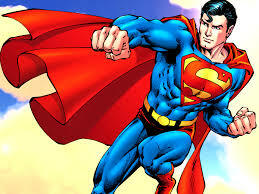 Superman was first introduced to the world in comic format in June of 1938. He's one of the coolest superheros around. He's been in comics, TV shows and movies. I love superheroes and I found some interesting facts about Superman. 1. Superman and Clark Kent have different birthdays. June 10th is Superman's birthday. It's the day he landed on Earth. June 18th is Clark Kent's birthday. It's the day he was adopted by the Kent family. 2. He wasn't born super. Clark Kent grew more powerful as he got older as it was able to store more solar energy and convert it more effectively. 3. The S isn't just for Superman. A Kryptonian glyph that served as a family shield for the House of EL, which means "hope." When he first appeared in 1938, he was incredibly strong, could withstand anything less than a bursting shell from a tank and was able to leap an 1/8th of a mile. It wasn't until 1941 when he gained the ability to fly. Radiation of a red sun immediately robs him of his power. There is much more information about Superman on www.newsrama.com that you can check out when you have time. So join me at the library to read some of our great Superman titles and find out about some of his other superhero friends. You'll find me reading about Wonder Woman next!